Nothing lasts forever, and that includes the computer you use to write email, balance your budget, and read this newsletter. Eventually, it will physically wear out. But before that, it will probably become obsolete. And that's a lot worse than an obsolete haircut or wardrobe. An old computer, like a carton of milk passed its expiration date, can actually be dangerous. Older computers are less secure. And in a world where cybercriminals want to take over your computer, you need as much security as you can get. Do you hear grinding or clicking noises? If your computer starts making sounds it never made before - and I'm not talking about your grandkids' choice of music - you've got to work fast. Is your data completely backed up? If not, back it up now. If you don't know how, any repair shop can do it for you. If the computer is less than three years old, you might consider seeing if the shop can fix your PC. Otherwise, a new computer would be a better solution in the long run. Is it just too slow? Over time, your computer will get slower. It's a matter of up-to-date software running on out-of-date hardware. Most programs update themselves regularly. These updates give you better, more secure programs. But they also give you larger and slower programs, designed for today's faster hardware. The biggest bloat issue probably comes from the biggest program of all - your operating system. The program that controls all the others must be secure and up-to-date. There are ways to speed up a slow computer. You can remove programs, turn off background tasks, and physically improve the machine (for instance, by adding RAM). But if you're not a techie, these changes are difficult. And besides, they can only go so far. If the computer is just too slow, it's probably just too old. Can you run the latest version of your operating system? As I've already mentioned, your operating system changes with time. Eventually, your hardware can no longer support the latest version. In the case of Windows, you have both updates and upgrades. If you use, for instance, Windows 7, Microsoft regularly updates it to a better, more secure Windows 7. But for the best security, you need to upgrade to Windows 10 - which costs money and doesn't happen automatically. And it might not even be possible on your computer. To find out, download and run the Windows 10 Upgrade Assistant. If you're using Windows 7, chances are that you can upgrade to Windows 10. But if you're running Windows XP, it's time to buy a new PC. Microsoft doesn't even support XP anymore; it no longer gets security updates. Many XP PCs can run Windows 10, but not well, and the upgrade is difficult. Buying a new PC just makes more sense. If you have a Mac, check these instructions to see if you have the current version. Computers aren't just getting faster; they're getter smaller and lighter. 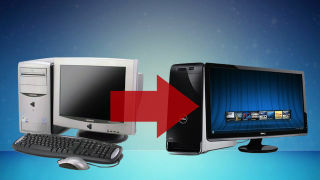 If you have a desktop PC that stays in one place, that's not a major issue. But if you want to move the computer from one room to another, or take it with you on vacation, the lighter the better. You'll be amazed at how thin and light today's computers can be. And how cheap. They have other advantages. Many of them have touchscreens, which makes it easier to select items onscreen. They often have HDMI ports, allowing you to plug them into your television. And they have faster USB ports for quicker backups. Buying a new computer costs money, and it takes time to set it up. But when the time is right, it's worth considering.